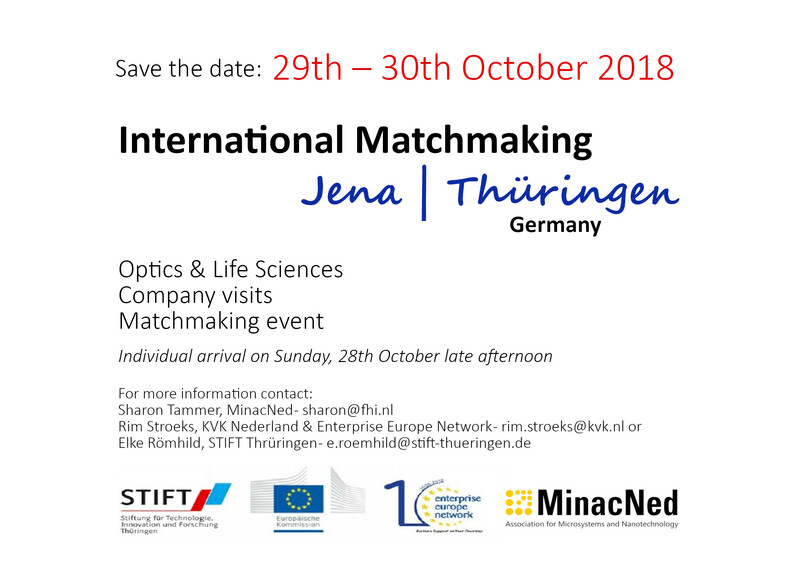 In collaboration with Medways and the Enterprise Europe Network in the Netherlands and Thüringen, MinacNed would like to invite you the 29th and 30th of October on our special 2-day company mission: the International Matchmaking Event in Jena, Thüringen Germany. The focus of this mission is on Optic & Life science, therefore the area Thüringen is the perfect place to visit. This area is characterized by a large diversity of high-quality innovative companies and research facilities. 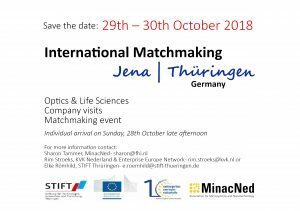 We will take you with us to visit companies, give matchmaking possibilities (bilateral meetings based on catalogue selection), show you the Carl Zeiss Planetarium, involve you in a mini forum, laugh with you at the social dinner and offer you plenty of network possibilities. 12:30-15:30 Lunch and a possibility for bilateral meetings. Notice: These meeting has to be arranged in advance, so sent your selected companies together with your registration form. 15:30 Closure with a possibility for individual meetings with companies. Travel to and from Jena is for own responsibility. We have a shuttle bus available on site. 20 single rooms (€ 109/night incl. breakfast) these rooms can be booked by the participants until the 30th of September. Please use the discount code: “Stiftung für Technologie” via reservation@jena.steigenberger.de. Later bookings on availability.